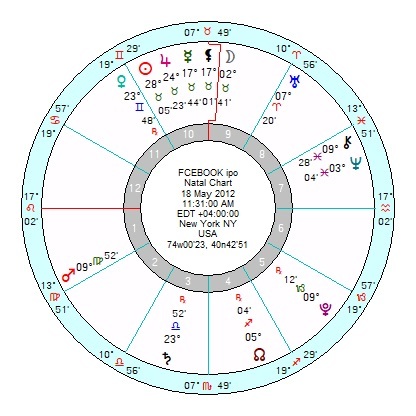 The Facebook IPO chart, 18 May 2012 11.31am New York, looks rattled and blocked this year with tr Saturn square Uranus, conjunct Pluto and sextile Mars until the year end. With a tough, discouraging slog through 2019/2020 with tr Pluto square Saturn; though will bounce again come 2020 with tr Pluto trine Jupiter. 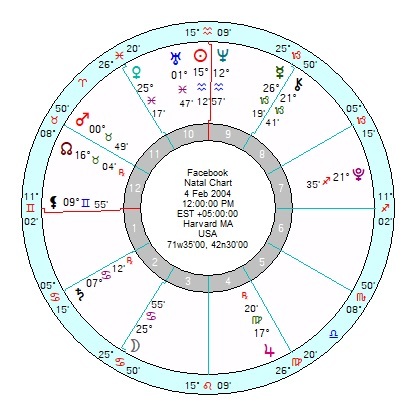 The Facebook start chart, 4 February 2004, looks agitated at the moment with tr Uranus square Mercury; and alarmed come mid May with tr Uranus conjunct Mars, continuing on into 2019. 2020 looks less enthusiastic than the IPO chart with Solar Arc Sun conjunct Uranus and Solar Arc Mercury conjunct Neptune – though if it was a 12am start, then could pull those two influences forward to 2019. 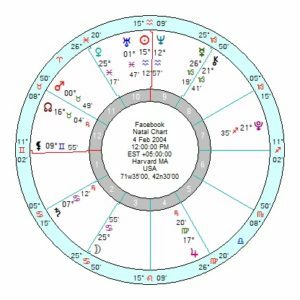 Mark Zuckerburg also doesn’t look that easy this year with undermining and uncertain Neptune transits to midpoints 2018 to 2020; plus a disruptive tr Uranus opposition Pluto from mid May this year into 2019. Cambridge Analytica (I have a date of 30 July 2014 though don’t know where that came from since incorporation was 6 January 2015) but neither chart is exactly informative. 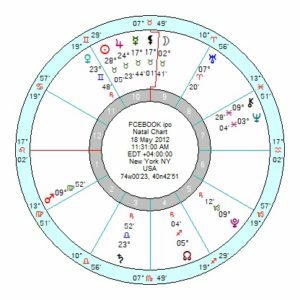 The 2014 chart has an opportunistic Sun Jupiter square Mars, which is getting a sharp elbow in July from tr Uranus opposition Mars, running into 2019. And the 2015 chart has an equally opportunistic Mars opposition Jupiter; with a controlling Sun Pluto in an innovative square to Uranus. 2019 will be restrictive with tr Saturn crossing Sun Pluto and squaring Uranus. The SCL Group,20 July 2005, is more obviously racked with insecurity with tr Uranus in hard aspect to its Cancer Sun square Mars in Aries; with more sharp shocks and tensions as tr Uranus starts to square the Saturn from mid May. Cambridge Analytica’s parent company Strategic Communications Laboratory chockablock full of Tories. UK MoD a client with Lords, ex-Army UK Officers and Tory donators on the Board. Question are now being asked about the 2014 Scottish Referendum, 2016 EU Referendum and 2017 General Election. Pluto in Capricorn cleaning out the sewers of the political process – everywhere? It’s mind-blowing what CA got up to in Kenya and the Caribbean as well and India etc etc. Slagging off opponents has always happened but internet manipulation just ramps up attacks to nuclear level. ‘Crooked Hillary’ – non-Americans truly do not understand the hostility that was waged against her – and that appears to have been a Cambridge Analytica ad slogan. There was a staggering statistic somewhere about how many voters only got news from their Facebook timeline or Fox. You forget how little interest most have in the news; don’t read across a spectrum of opinion; and get easily swayed by one catchy phrase – MAGA, Give £350m a week to the NHS not the EU etc. News is equally distorted by right and left in USA. Hasn’t been any honest reporting for quite sometime. I’m sorry, I think you and people in general do not understand what’s going on here. This is not usual targeting based on cookies that can be addressed with se private browsing for. The point is Facebook opening your information, and the information of your friends, to dubious third party developers. This really isn’t news. 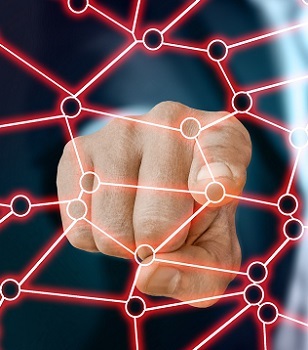 The news is this has been used to influence political elections. This is possibly illegal in most Developed Countries. This should put a dent in Zuckerberg’s plans to run for president one day. I think Facebook knew exactly what Cambridge was up to. Who knows what or how he intended to use that information for himself and to further his own political ambitions. He’s been positioning himself for well over a year now. He has been nowhere to be seen. He is also lucky to avoid jailtime when this unveils. Probably trying to pin it on someone else. Yep, as soon as the 2016 election miraculously swung Trump’s way, Zuckerberg started openly talking about running for president. He seemed buoyed by something and I think he knew exactly what had CA had done for Trump so he was positioning himself for the same. Once Congress started asking questions last year he shut up. Now that more pressure is on he’s nowhere to be found. What a creep. I saw 1 May 1975 on http://www.heavy.com. Alexander Nix that is. Thank you very much! If exact, he would be a Taurus Sun and a Capricorn Moon, same combination Melania has, with his Moon quite possibly under Pluto influence. He’d also have “Fall of Saigon” Aries Jupiter – Cancer Saturn – Libra Pluto T-Square. 19′-21′ Gemini Mercury. Apparently, he was caught on camera boasting and explaining exactly how Cambridge Analytica wan him the election. 23′-25′ Taurus Venus, hitting DJT’s MC. He didn’t bring the money directly, but he delivered those votes enabling DJT to earn money. Something to be noted is that Facebook is a teenager in Human Years. Saturn opposition coming… I doubt the young people born Feb 4th 2004 have the easiest time right now, either, or their parents. It just appears Stormy Davies doesn’t matter anymore, and could, in fact been used as a distraction by The Brittish Journalists working on this story. Alexander Nix apparently also gave a sales pitch to a potential client, who happened to be a Channel 4 Reporter undercover, telling he could provide kompromat to beat competition (aired tonight) and also explaining exactly how they wan The US Elections (airing tomorrow). I don’t know if anyone has the exact birthdate, I’ve heard “May 1975”, which would give him plenty to worry about with Saturn alone. This is going to be The Big Story through 2018, with The US, The UK and The EU Authorities already calling CA and FB officials on hearings. Amazing, old school reporting done here. Yes, excellent reporting from Carole Cadwalladr on twitter.